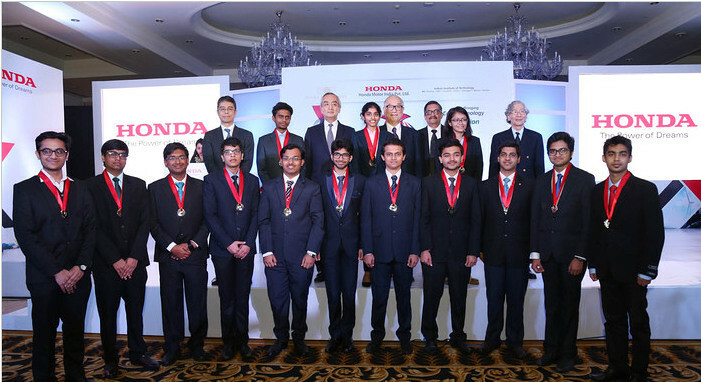 Honda YES Award 2016 Winners are announced by Honda Motor India (HMI). A total of 14 students has been selected in the winner's list. This is the 10th Edition of “Young Engineer and Scientist’s (YES) Award. The 14 students are selected from India’s leading Science and Technology Institutes, the IITs, across India. The YES Award is given year since 2007 to the bright students of IITs after an arduous evaluation by a panel of Senior Honda Executives and leading Indian Scientists. The 14 Winners will receive a cash equivalent to US$ 3000 who are selected from 8 IITs that is Delhi, Bombay, Roorkee, Madras, Kharagpur, Kanpur, Guwahati and BHU on the basis of their Cumulative Grade Point Average (CGPA), essays and two rounds of personal interviews with the selection Committee of Honda Executives and Shirish Garud, Director- TERI, the chief assessor of the selection committee. The YES Award was started by Honda Foundation in the year 2007 in India by Honda Motor India to nurture young students who have shown excellence in the field of Science & Technology and aims for higher development in their academic level. With the help of Honda YES Award, Honda Foundation hopes to promote dissemination of eco-technology among the young generations. Apart from distribution of eco-technology, Honda Foundation also provides a platform for Indian and Japanese students to interact and exchange their views and notions related to Science, Technology and Industry. 14 winners were awarded at the Honda YES Award Ceremony 2016 by the Chief Guest H.E.Kenji Hiramatsu, Ambassador Extraordinary and Plenipotentiary, Embassy of Japan. The Award was presented in gratitude of their outstanding all-around performance in academics. Apart from H.E. Kenji Hiramatsu, Honda Foundation President, Hiroto Ishida was also present as guest of Honour. Kenichi Takashima, President and CEO of Honda Motor India Said about the YES Award 2016 that they are delighted to announce the 10th Edition of YES Award and their 10 years journey has got wonderful response and enthusiasm from the IIT students who have executed their best effort to present their work. He also added to his conversation that they had awarded 126 students since last 10 years for the YES Award. Concluding his conversation, he said that they want to provide such students with YES Award so that they can fulfil their dreams as such platforms encourage young talent to involve in higher research in the field of Technology.